Formidable Forms is recognized as the Most Advanced WordPress Form Builder by WordPress experts. Build a single contact form or complex multi-page forms with conditional logic, calculations, and file uploads. Then display the collected data with views and graphs. Get far more than just WordPress forms. Join thousands of others who have gone beyond basic WordPress contact forms and are now using Formidable Forms to create online applications and data management systems for tracking, real-time data visualization, and payment collection forms. Is limited time or coding knowledge holding you back from the projects you dream of? Remove the obstacles by choosing the right tools for the job. Show your clients the amazing applications you can build. We're here to help you shine for your clients so they keep coming back for more. With a virtually unlimited WordPress form builder and application builder in your hands, your imagination is the only thing holding back your business. Take on bigger WordPress projects right now. You can do far more. Earn more clients and grow your business with our virtually limitless WordPress form-based solutions. "I was able to achieve a specific goal for one of the websites with $500 in software and three months of development where the two years before my arrival, $40,000 had been spent on software and hardware with zero results. I was able to meet all requirements of the job application, including applicant signatures!" Are you continually running into road blocks with your current development tools? Have you been trying to make dozens of plugins play nicely together and “just work” for your advanced projects? If this sounds familiar, the problem is that you are using the wrong tools. They simply weren’t designed with complex, dynamic applications in mind. Unlike any other form builder, Formidable Forms is the only WordPress form plugin that integrates views directly into the core plugin. 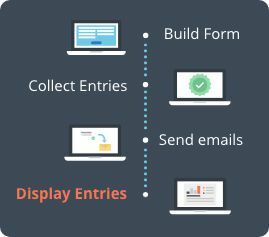 Don't just collect form data. Use it to create listings, directories, and any other data-driven web application you or your client can dream up. Formidable Forms a full-featured WordPress form builder plugin. WordPress forms plugin in one easy-to-use package. Build complex forms the easy way with a simple WordPress drag and drop form builder. Click or drag a new field into a form, with no HTML required. Add new posts and pages with WordPress front end posting. Set custom fields, titles and even a featured image. Create new posts as drafts to allow admin moderation. Display statistics from form entries, and graph your data in a variety of eye catching styles with graphs that automatically update as new data is submitted. Use the power of cascading fields to display options available by each field "watching" the previous selections. Can also be used to drill down through the options to reveal a final value. Complex calculations are easy with Formidable Forms. Give instant online estimates, calculate advanced product options, or even interest/repayment calculators. About 5 years ago I purchased a lifetime license for Formidable Pro and it turned out to be one of the best decisions of my professional life. I’ve built numerous websites, shops and web applications using Formidable. Creating my own revenue generating website from scratch was a unique and rewarding experience. This website was created from scratch by a person with almost no programming or design background. One of the biggest pieces of that success was Formidable Forms. The Formidable Forms team believes that you are in control of your life. And we're here to help you change it and look good for your customers while doing it. We are a remote team from around the globe, and have had clients of our own. Our world-class support is ready when you are.